Discussion in 'TCG News & Gossip Discussion' started by Quatra, Nov 6, 2007. The DP sets have some really great cards in them. But what's up with the RH cards? I bought 12 packs this Evening and had 5 RH cards with a nasty line going down the middle of it. I know a Topic such as this was created a while back with DP 1. But i'm wondering if anyone else has had these same flaws in them. You'd think they would see the issues with the RH cards for the DP sets, and change it to something better. Having the background Holographic is nice, but it also means that they are more prone to scratches. Playability doesn't require Mint cards, as they tend to get beat up in play anyway. But for collectors it means that if we want a near Perfect card, we have to get another copy of the card. Anyway, just my 2 cents on the subject. Is it an actual scratch or just one of the lines where the foil went? When they make the cards, sometimes the foil sheet isn't as big as the card sheet making there a small line in the foil where they joined the sheets. If it's just the foil line then that doesn't make increse or decrese in value, thats just how they make the reverse foils now. EDIT: Here is an example of a foil line. (In the midle of Gardy) This card for example, is still considered in mint condition. I've decided that if that is how it is when i pull it from a pack, then that's considered to be mint. And you have to sleeve the PFs as soon as they are out of the pack so they do not get scratched - lost a whole prerelease worth of PFs because i had them in a deck box unsleeved. I thinkt that the DP sets are being made very carelessly. They also made the reverse holo cards ugly! The line is not a scratch, as in it had been damaged by a finger nail or something. But more the Foil sheet itself has the line in it. For me, i can handle faint lines. But not very obvious ones. It just seems that they are using some really cheap material, that in my opinion makes them look non-mint. 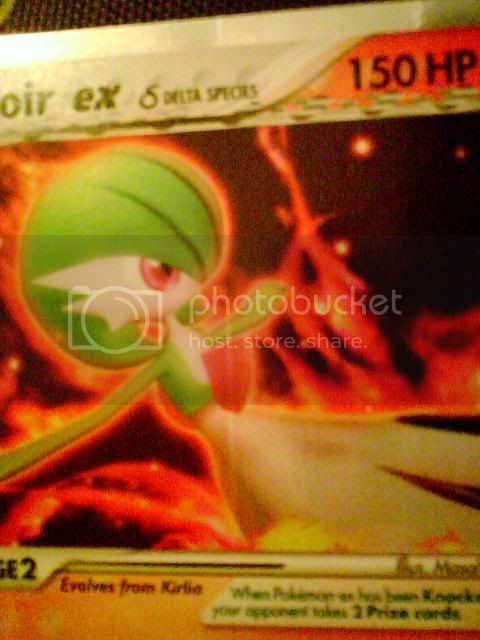 Can't they go back to making the pictures holo instead of the cards. When they did it that way the cards looked way better IMO and they weren't so easy to scratch or ruin. The ex series reverse are BEASTS and DP reverse cards are for newbies. Yeah, DF holos were awesome. The EX series had this same reverse foil pattern for the first 4 sets, too. I don't know why they went back to it, since everyone seemed to like the most recent pattern (HL-PK, each set is a little different, but they're basically the same) best. These holos are easier to scratch, but I noticed a huge difference from DP1 to MT. The DP1 holos were terrible. It looked like they made MT holos a little better, so they didn't scratch as easily. Looks fine to me. Lucky? look at the back of your cards. some of them also had disproportoinal dark-blue borders on the top edge i think. I liked the alt holos from the ex sets that had pretty patterns in the holos. UF 3D Pokéballs ftw.